Summary SEALED-TECH deep cycle, maintenance free, batteries offer a great performance value and are an excellent replacement for OEM batteries. Battery dimensions are 6 7/8" long by 3 7/16" deep by 6 1/8" tall. Types Fits Honda and some Kawasaki watercraft. Please refer to your owner's manual for specific battery requirements. Our exclusive SEALED-TECH line of batteries is an excellent OEM replacement unit with many extra features not found in standard OEM replacement types. All SEALED-TECH batteries provide ideal cold-cranking amps and extra reserve capacity. In fact, the shelf life is three times longer than the conventional watercraft batteries. In addition SEALED-TECH batteries are totally Maintenance Free, Deep Cycle and Leak/Spill Proof, an excellent performance value. JetWorks has incorporated the Absorbed Glass Mat (AGM) construction technology. This allows for superb electrolyte retention within the highly absorbent micro-porous glass mat and poly plate separators, which provides long term service life. Plate -Lock manufacturing methods ensure maximum shock resistance and reliability, even under the most severe riding conditions. Finally, say good-bye to the days of corroded cables and terminals. 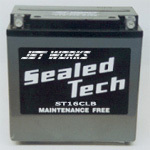 All SEALED-TECH batteries feature epoxy sealed terminals that prevent capillary wicking. What it means is the end to corrosion build-up around the terminal posts, period. A single, one way check valve and special manufacturing techniques allow us to offer a high quality, maintenance free battery at an affordable price. High power, deep cycle with AGM construction technology with extra reserve capacity that allows it to have a long term service life. 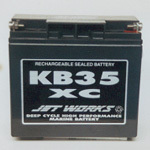 The JetWorks KB35XC gel-filled battery is unlike any other PWC battery on the market. These ultra high powered units are maintenance free, deep-cycle, leak/spill proof and do not require fluid checks or refilling. Battery dimensions are 6 7/8" long by 3" deep by 6 1/2" tall. NOTES: Fits perfectly in Yamaha and most Kawasaki watercraft. 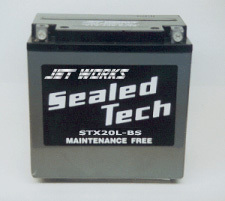 Other makes of watercraft may require an additional mount, which can be obtained from JetWorks, to support this battery. SEALED-TECH deep cycle, maintenance free, batteries offer a great performance value and are an excellent replacement for OEM batteries. Battery dimensions are 6 7/8" long by 4" deep by 6 7/8" tall. NOTES: Fits Yamaha, Polaris and some Sea-Doo and Kawasaki watercraft. Please refer to your owner's manual for specific battery requirements. SEALED-TECH deep cycle, maintenance free, batteries offer a great performance value and are an excellent replacement for OEM batteries. Battery dimensions are 6 5/8" long by 5 3/16" deep by 7 3/4" tall. NOTES: Fits Sea-Doo (4 Stroke) watercraft. Please refer to your owner's manual for specific battery requirements. 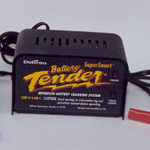 The super smart battery tender is designed to maintain and keep your personal watercraft battery in perfect condition throughout the year.